from the world outside the door. - from "Bells Sound Like Birdsong"
Tandem Bicycle by Robert Grant Price is a collection of plainly spoken lyrical poems. A debut collection, this book shows range and maturity. Included is the long poem "Bells Sound like Birdsong," a 900 line poem in fifteen parts. The poem presents a range of voices speaking on matters of universal concern: Why are we here? What holds us together as a people? "So What Kind of Writer are You, Exactly?" 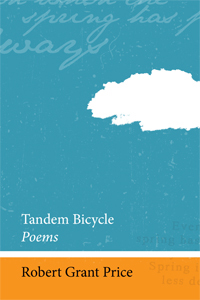 Tandem bicycle : poems / Robert Grant Price.